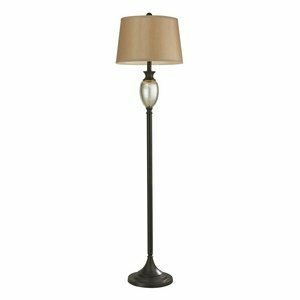 This well designed Caledon Antique Mercury Glass Floor Lamp by Sterling provides a unique contrast of light and dark. A gorgeous shimmering cast of warm light and rich character bring a touch of glamour into any transitional space. This is an easy way to modernize and update a traditional decor. 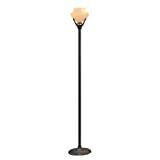 The lamp stands 63 Inch tall. A hardback silken drum shade in complementary shade of Bavaria Gold measures 17 Inch wide x 11 Inch high. Lamp has a 3-way switch and accepts (1) 150w medium bulb.